NHAI “secures” the bonds against roads that it doesn’t own (they’re owned by the GOI). Debt’s gone up substantially in the last few years. In general, that would be true. But this NHAI has always been a special beast. So my view differs, but let’s take this one step at a time. Firstly, let’s take the FY17 Annual Report of NHAI. 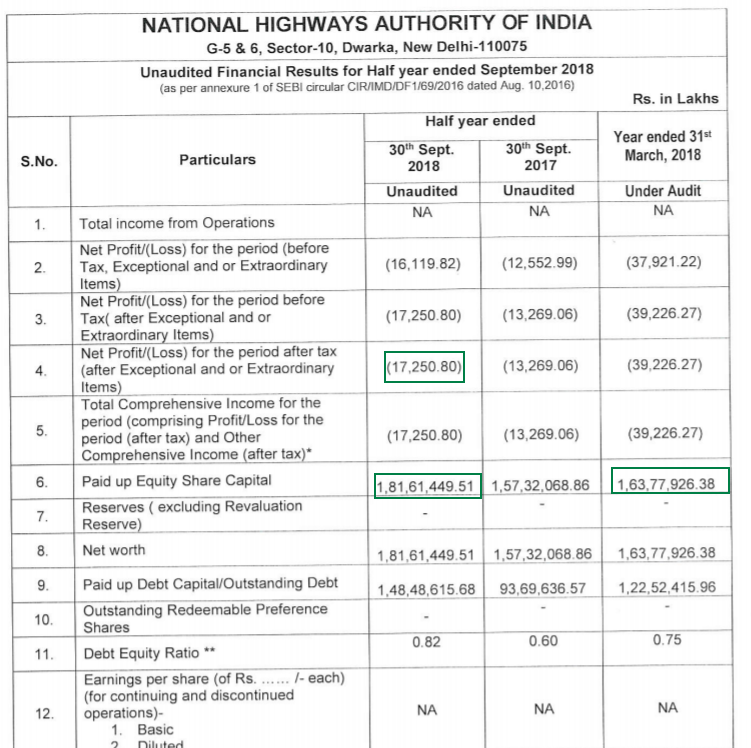 (FY18 isn’t yet out) We have to look at NHAI accounts very differently from others. Why? NHAI is a special company. It doesn’t even have shares. The government owns 100% and keeps adding more and more capital to it. And NHAI was not designed to produce income or operating cash flow. That’s right. . All that it makes, from toll revenues, goes straight to the “Consolidated Fund of India”. 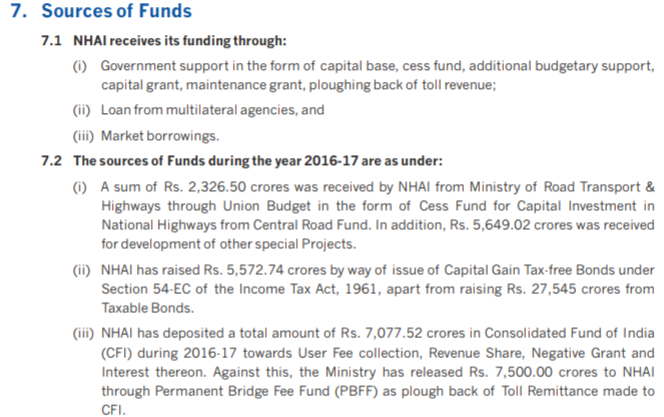 What it gets is a “grant” from the government – basically, the government puts more capital into NHAI. Read that again: What it makes from tolls is not its revenue. In return, it gets more capital from the government. Which creates havoc in traditional accounting statements. If you don’t have operating income, you don’t have operating cash flows. It looks like you’ve taken on debt that can only be paid if the government is benevolent enough to add more capital every year. But that’s how the government does it – it just adds capital, and that’s how it’s all balanced. Essentially it’s losses of around 173 cr. are more than covered by the increase in equity, in six months, from 163,000 cr. to 181,000 cr (an addition of Rs. 18,000 cr). The Debt to Equity ratio is still 0.82 – which is higher than earlier, but still quite reasonable. So How Does NHAI Make Any Money? We have FY 17 annual report only – and in that, the total debt was about Rs. 75,000 cr. For which, their interest costs have been roughly 7% to 8%. Considering the upper level, that would mean an interest cost of Rs. 6,000 cr. Note: About 13,000 cr. of this debt was at 6% (Capital Gains bonds). In response to an audit query, it states that NHAI is “an executive agency of the Government of India, and does not have any income“. But they do make money: Tolls. How much? They got about 7,000 cr. in tolls in FY17. Apart from that, they got Rs. 2326 cr. from Cess collected (part of the Income tax collections is a road cess). They did raise Rs. 32,000 cr. 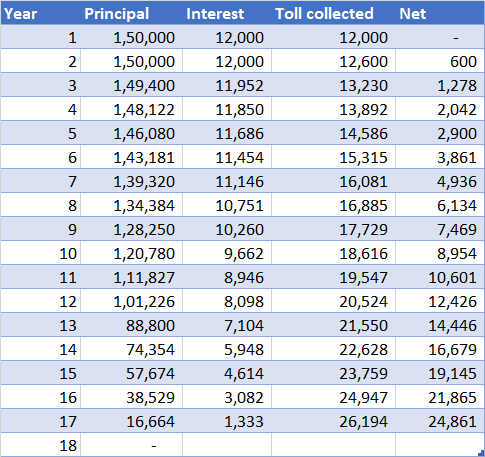 additionally from taxable bonds and Capital gains bonds (and redeemed some) but it’s clear that the interest payment on these bonds was more than covered by the tolls received (7000 cr.). There’s also an additional 8,000 cr. (cess plus development funding) that was added by the government. How Can NHAI pay back principal? It has to keep rolling over the bonds! Yes, you can say all governments are ponzi schemes. They need more debt to pay back current debt. That’s how it is. And if you don’t pay them your taxes, they’ll put you in jail. So they are extortionists too. But no one calls them that because it’s okay, apparently. It is possible to be outraged, but there’s a lot more peace when you know it’s all subjective and gray. Consider this – that tolls go up 5% a year and debt and all activity is frozen in time right now. Assume the government pays for any road maintenance and operational costs. Even with Rs. 150,000 cr. debt at 8%, we’re speaking of a cost of Rs. 12,000 cr. today, which the toll collections and user cess taxes cover. If you freeze it in time right now, and tolls rise 5% a year, you have 17 years at which the entity becomes debt free. In the infra space, a 17-20 year gestation is not a big deal, and if interest rates fall (8% rates at 5% inflation doesn’t last too long) we should see the time period reduce further. But 150,000 cr. debt Should Be On The Government Books! Yes because this is borrowing that is quasi guaranteed by the government. But it’s not huge. The total borrowing of the central government in FY17 was about 61 lakh crores. Of that, the Rs. 75,000 cr. is around 1.2% more. Even if you consider 150,000 cr. of debt, then the public debt of the central government is probably about 68 lakh crores – again, roughly 2%. This is a “shadow” loan of the government, and there is an implicit guarantee of the government on NHAI loans. The 2% could be troublesome, but it’s not so big that it causes serious worry. (Bigger concerns are FCI, Pensions and PSU banks). And the government is sovereign, so NHAI is AAA. Debt investors don’t care about investors making profits. They care about the intent to return money, which the market seems confident about. Why Has The Debt Gone Up? We’ve had a massive expansion in road programs in the last few years. The eventual plan is to have some 400,000 cr. here. The second reason is the shift of program types. 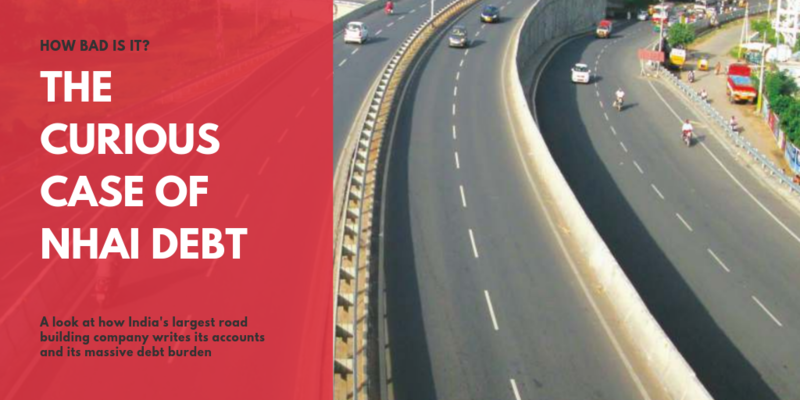 Earlier, road projects were PPP – Public-private-partnerships, where the government only provided the land and rights to the land, and private operators borrowed to build and operate the road, collect the toll etc. The Government didn’t have to pay anything. That didn’t work out well – when traffic estimates weren’t met, these projects took big losses which eventually fell on the banks (and thus on the govt). Now, they do HAM (Hybrid Annuity Model) projects and EPC (think of this as plain contracting). Meaning private operators get paid to build the road – in HAM it’s over 20 years, and in EPC it’s relatively shorter. The earlier BOT type projects needed the NHAI to need no money upfront – but in HAM and EPC, NHAI has to pay. S0 debt goes up faster than earlier. I do not support giving governments endless amounts of money. But one thing that is surely the responsibility of the government is: roads. As long as India doesn’t reach a point of total and wretched failure, I’d say an investment in NHAI debt is sound. Even if the books of NHAI need to be fixed – lots of horrible errors there for sure – and even if they need funding each year. Just never buy their equity as a shareholder.